Savarin Springs is a family owned and operated bottled water delivery service for the K-W and surrounding areas. We’ve been serving businesses and residential homes for over 25 years. 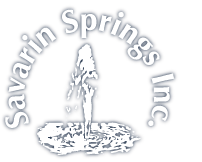 Our spring water comes from a 950 foot deep, Savarin Springs owned artesian well, located in scenic Formosa, Ontario. All of our water is tested daily by an independent lab to ensure the finest quality water. For quality bottled water, excellent customer service and FREE same or next-day delivery, call us today! Our delivery gentlemen are fast, friendly and courteous. They are the frontline of our business and represent our public image. We have a store on-site for discounted pick-up and a water station if you prefer to fill your own bottles. Of all the compounds found on earth, none is more vital to the survival and health of the human race than water. Savarin Springs Inc. shares the concerns we all have regarding chemical treatment for water purification. These chemicals affect the taste and purity not only of our drinking water, but also of the foods and beverages we prepare. Savarin Springs water is not chemically treated, so you will taste the purity and freshness as water was meant to be. Nutritionists recommend drinking 8 to 10 glasses of water a day for optimal good health. With the convenience of refreshing Savarin Springs bottled water delivered right to your home or office, it is easy to meet your body’s requirements. Your family will choose our water over less healthful and more expensive beverages. Water from Savarin Springs Inc. is great for drinking, cooking, making juices and freezing ice cubes. We also offer chemical free steam distilled water which is boiled in a distiller. The steam is collected then turned back into pure water with less than 2ppm of minerals. Our R.O. (purified by reverse osmosis) is forced through a semi-permeable membrane with approximately 10ppm and is ideal for cooking, coffee makers and crystal clear ice cubes. Our water is micro-filtered and ozonized. We put our water through stringent daily tests from independent laboratories conducted both at the spring and bottling facility.